While a first-class batting average over 50 is outstanding, Cartwright’s List A record isn’t good. In last season’s Matador Cup, he only managed 101 run from his six gamesm, with a batting average of 16.83 – hardly numbers that demand selection. Tim Paine and Cameron White have been dominating domestic one day cricket for years and don’t get picked, while Peter Handscomb has recently finished a productive county stint with Yorkshire and only got picked as injury cover. Yet Cartwright’s selection is by no means the worst decision the Australian selectors have made in recent times. The most obvious selection blunder of recent times was Mitch Marsh in the Test squad for the tour of India. Dropped from the side for not scoring enough runs, Marsh managed scores of 0 and 16 in his only Sheffield Shield game since being dropped. This was good enough for the selectors, who put Marsh straight back into the Test side, and he averaged 12 in two outings before injury ruled him out of the rest of the series. 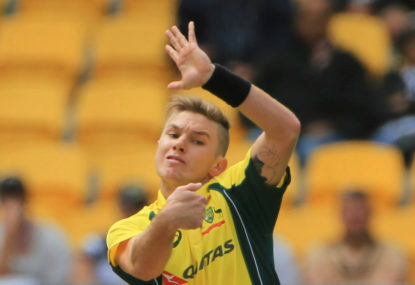 Adam Zampa was the leading ODI wicket taker in 2016, with 30, before being dropped during the home summer and playing just three of Australia’s eight home ODIs in 2016-17. Matthew Wade was brought back into the Test side to strengthen an inexperienced batting line, but in his 12 first-class matches prior, he scored 302 run at an average of 23.23, with just one half century. Wade’s Test numbers since being recalled are no better, averaging 20.23 with one half century from ten matches. He must be dropped for the Ashes. Steven O’Keefe was was Australia’s joint leading wickettaker in India, with 19, and was then dropped for the Bangladesh tour due to ‘poor form’. O’Keefe was then added to the Test squad midway through the Bangladesh sereis, where his bowling wasn’t as good as in India – but is that really a surprise, seeing as he didn’t have any preparation? For Australia to be successful, selectors must pick the best players available, which means picking players who are performing at domestic level.